Y’all. It’s about the get delicious up in here. 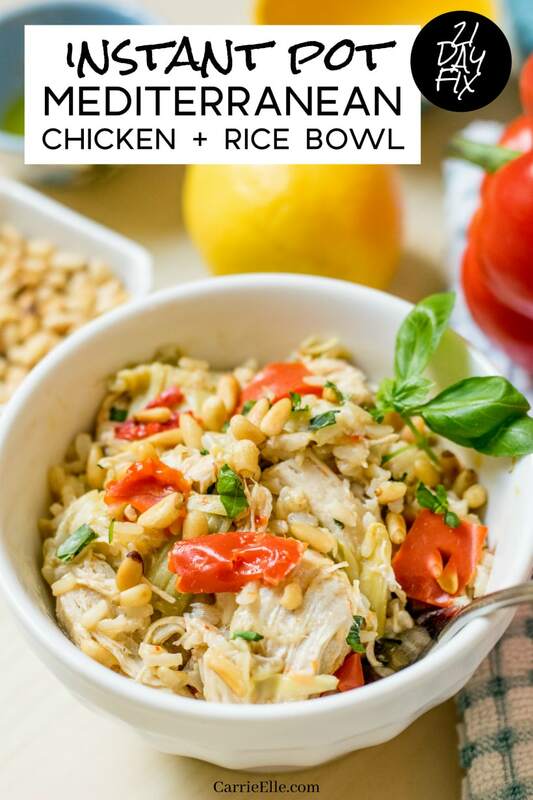 I’ve partnered with Tom Thumb to bring you these these insanely flavorful and satisfying 21 Day Fix Instant Pot Mediterranean Chicken and Rice Bowls and you are going to love them. The best part is, they’re super easy to make – I made these with frozen chicken breasts that we’d prepped awhile back. This is meal prep at its finest – this recipe makes six generous servings and some seriously tasty leftovers. Of course, I’ve included 21 Day Fix container counts at the bottom of this post for you – and Weight Watchers Freestyle Points, too! I picked up all the ingredients for this recipe at my local Tom Thumb (which also delivers – and yesterday, as I was ordering groceries, I learned that they now offer doorstep delivery, which means you don’t even need to be home or answer your door. #introvertsdream). You can also find all of these ingredients at Albertson’s. I buy my Signature SELECT™, Signature Kitchens®, and Signature Farms® products, available exclusively in my area, at Tom Thumb and Albertsons stores. You can also find them at all Albertsons Companies family of stores, including ACME Markets, Safeway, Jewel-Osco, Vons, Pavilions, Randalls, Shaw’s, Star Market, and Carrs/Safeway. Visit Albertsons or Tom Thumb to find a store near you and discover more meal prep tips and recipe ideas. We shop at Tom Thumb because it’s close, and we trust their store brands. The Signature Farms™ chicken is a great value (I have a ton in my freezer right now! ), and when you’re eating healthy but also shopping on a budget, that’s important. Here’s what you need to make these Instant Pot Mediterranean Chicken and Rice Bowls. You’re going to love all the flavors in this easy Instant Pot Mediterranean bowl recipe! READ THIS BEFORE YOU MAKE IT: This recipe was made using a 6qt Instant Pot. If your pot is larger, you’ll need to adjust accordingly. Also, altitude can affect your cook time – here’s a really helpful post about how to adjust your pot for altitude. Turn your Instant Pot to sauté. Let it heat up, and add your olive oil. Once the olive oil has heated, add your red bell peppers and artichoke hearts and sauté for 4-5 minutes. You want to let them get a little brown, but you don’t want them too soft as they’re going to cook more when the pot comes to pressure. Turn the Instant Pot off. Add your chicken breasts, lemon juice, and salt and pepper. Pour your rice evenly over the ingredients. Add your chicken broth. Place the lid on the Instant Pot. Close and make sure it’s in the lock position, and that your valve is set to “seal.” Turn on manual for 20 minutes. Once done, let the pressure release naturally for 10 minutes, then quick release the remaining pressure. Open the lid carefully. Using forks or a hand mixer, shred the chicken (take it out first if you’re going to use a hand mixer!). Once the chicken is shredded, mix all ingredients together. This will help any extra liquid soak into your chicken and rice. Let it sit for a few minutes, then scoop into your bowl. Top with chopped basil and 1 tablespoon of toasted pine nuts. You could also add olives, and my friend Nancylynn suggested feta, too – that would be amazing! This Instant Pot Mediterranean Chicken and Rice Bowl is dinner in a bowl! It's the perfect dinner (with amazing leftovers) for the 21 Day Fix, Portion Fix, and Weight Watchers. Turn your Instant Pot to sauté. Let it heat up, and add your olive oil. Once the olive oil has heated, add your red bell peppers and artichoke hearts and sauté for 4-5 minutes. Just let them get a little brown, but you don't want them too soft as they're going to cook more when the pot comes to pressure. Place the lid on the Instant Pot. Close and make sure it's in the lock position, and that your valve is set to "seal." Turn on manual for 20 minutes. Open the lid carefully. Using forks or a hand mixer, shred the chicken (take it out first if you're going to use a hand mixer!). Top with chopped basil and one tablespoon of toasted pine nuts. The 21 Day Fix program is always changing, and while I do my very best and never want to mess up (perfectionist, yo) please always double check the container counts yourself. Sometimes/usually it’s late at night when I write these posts. Thank you to Tom Thumb for sponsoring this post. My chicken is not frozen, how should I adjust cooking time? What are the WW Freestyle points for this recipe? I used the WW recipe calculator and determined the Smart Points per serving is 4 without the Pine Nuts. That is the free style smart points. 2 questions: How exactly would you adjust for an 8 qt pot (cooking novice over here)? Could you substitute cauliflower rice instead, or would the cooking time be too long? In that case, I’m guessing I would just cook the cauliflower rice separately. Is there anyway you could do this in a crockpot? Yes, definitely! I haven’t actually done it yet but this is a very crock pot-friendly dinner. Either sautee the veggies ahead of time on the stovetop *or* just toss them all in and don’t bother with the sautee step at all. I would probably do for 6 hours on low and add the toasted pine nuts and toppings before you eat it. Awesome thanks! I will try that. I’ve never done rice in a crockpot! I upped the amounts to 2 lbs chicken (fresh, not frozen), 1.5 cups rice, 2 1/4 cups chicken stock (I have an 8 qt instapot). Turned out AMAZING. I will probably increase the peppers next time, too. I used a heavy hand with the pepper and that really created flavor. Thank you for sharing – I’ve had people ask me about making it for an 8qt and never know exactly what to do! So glad you liked it! This was a FAIL made as directed. The chicken was not cooked through and the rice was crunchy and the dish was very liquidy (unlike the picture). After sauteing for 15 minutes the flavor was good, but the recipe needs work. I suggest a 5-10 minute NPR. I’m so sorry to hear that! I’ve never heard of that happening before! I had the same problem! It had too much liquid and the rice wasnt cooked all the way. It might need more time. That’s so strange. I wonder if you guys are at a higher altitude? That’s the only thing I can think of – until last week, no one has ever told me this and people in my FB group make this recipe all the time. I made this as written and it worked great! Thanks, Carrie!! My family loved this dish!! And I love that I can use frozen chicken – makes it so nice for weeknights. Right? I love this one too!